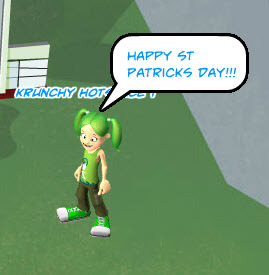 It’s time to put on your favorite green FunGoPlay outfit and head to Skillville to celebrate St Patrick’s Day with us! We’ll be having a great time just kickin’ and chillin’ so come say hello and make some new friends! We would love to hear about your favorite St Patty’s Day traditions! Why: You’ll get a pot of gold just for showing up! Ok, not really a pot of gold….but you will get 50 GoDough! Are you ready to “Shamrock”-n-roll?? See you in then! Can’t wait till Saturday? Click here to play now! Posted by fungoplay on March 16, 2012 in General.